Oxford. 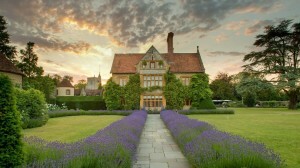 Le Manoir is a stunning, luxury restaurant / hotel / cookery school which is famously owned by celebrity chef Raymond Blanc and is part of a select group of UK restaurants with two Michelin Stars. There is a two acre kitchen garden in the grounds which means all the amazing food is also very fresh! Unfortunately this particular wedding party wasn’t able to take advantage of the rest of the beautiful hotel gardens because it was raining – good for the vegetables, but not for the bride and groom. However, the wedding was a small affair so the intimate Annexe space which had been booked was just right for the occasion. The Annexe has the advantage of being a private space and has its own kitchen, so wedding parties have all the privacy they need, with the advantage of dedicated chefs as well as the attentive waiting staff. Just as well because on this occasion, after I left, the wedding party sat down to a seven course tasting menu! I’d been booked to perform during the reception as canapés and drinks were brought round whilst the official photographs were being taken. The wedding party only consisted of 27 people, all of whom were fans of magic so I was on the go all the time. There was a bit of extra pressure on me because I was the only entertainment the wedding party had booked, but because of the intimate nature of the group and their enthusiasm for magic, I got to engage with everyone longer than I usually get a chance to. As there were so few guests, I was given my own little area and everyone came to me. This was a bit different to how I normally do things as it’s more likely that I’ll move around the crowd. All in all, it was a lovely, calm and laid back atmosphere and a very fun 90 minutes simply flew by. If you’d like to add a magical flourish to your wedding day, get in touch with me to find out how.